From 2005 to 2010, Activision released more than 20 iterations of Guitar Hero across every platform you could think of – console, handheld, mobile, and even a few on PC and Mac. That doesn’t even count the spinoff games like DJ Hero and Band Hero. By the time 2010 came around, most gamers were beyond franchise fatigue, along with Rock Band pretty much doing the same thing, it was just plain exhaustion. So we got a 5-year break. 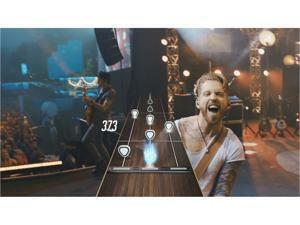 Now Guitar Hero returns with Guitar Hero Live and an all-new controller, all-new gameplay, and a new way to get music. The moment I launched the game, I was backstage at a venue with an audio engineer handing me a guitar and asking me to play notes so he could get the sound right. He was in a rush, because the show was about to start soon. I wasn’t ready for a show, man! 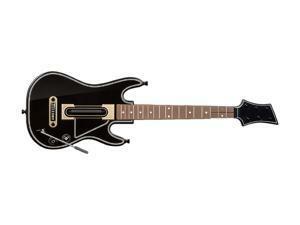 This new Guitar Hero controller has six buttons – three on top and three on bottom – and I wasn’t trying to make a fool of myself in front of hundreds of people. Luckily, this moment at the start of the game is the tutorial to learn how to play with this new controller and Guitar Hero Live’s new gameplay. The basics of music rhythm games is the same here, where you hold buttons and move the strum bar to match the notes on the screen, but it’s the way you do it that’s different. The black notes on the screen represent the top row of buttons, while the white notes represent the bottom three buttons. My thinking when first hearing about the new configuration of the buttons with two rows of three as opposed to one row of five buttons, was that it’d be a bit easier for me since I didn’t have to move my hand up and down my guitar’s neck and stretch my fingers to reach buttons while playing. Boy, was I wrong. I basically had to change my idea on how to play Guitar Hero and re-learn everything. 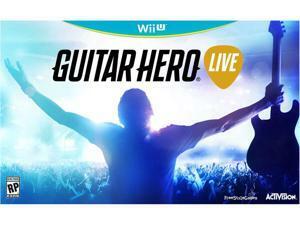 After playing Guitar Hero one way for 10 years, there’s a learning curve with Guitar Hero Live. People will have to have some patience when learning to play again. Guitar Hero Live allows for three people to play the game at once. Two guitars and vocals. There’s isn’t a bass guitar or drum option and the two people playing guitar are playing the exact same notes. It’s not even like a rhythm guitar support. But on the other hand, you can’t play vocals solo. You need someone on guitar to be able to play vocals, and it feels like just like a last minute add-on because there really isn’t an incentive to do well. While you do get some points, it doesn’t unlock anything; there are no rewards for doing well or any punishment for sucking. It’s just… there. I invited a few coworkers from the NewEgg office to give the game a try. After the tutorial, they started on Casual difficulty, which is just the bottom three buttons on the peripheral. It’s pretty easy. But when they made the jump to Regular difficulty, they commented on how steep the learning curve was, even after playing four to five songs. Some people were able to get the gist of it by the third or fourth song. After playing for a few days I was just getting comfortable with hitting a middle black note and a left white note at the same time. I mean, if it’s going to be this difficult, I might as well learn how to play guitar for real! Now if you can get past the learning curve, Guitar Hero Live offers a fantastic music game experience. For the game’s “career” mode, simply called “Live,” you’re what seems like a session guitarist in first person view playing with a number of bands at two different music festivals. There isn’t much of a storyline except each band you play with has unlockable bios. Activision and developer Freestyle Games went to great lengths to get real life band members and audience members to react to how well you’re playing a song. If you’re playing well, the crowd will jump, cheer, and sing along the whole time. If you play terribly, however, the crowd starts to boo, give you thumbs down, and even start throwing things at you. Your band isn’t too happy either, giving you dirty looks, talking trash to you while on stage along with disappointing looks from the stagehands and roadies. Guitar Hero Live does an excellent job of immersing you into a stage performance and giving you the exhilaration of a crowd cheering you on and the embarrassment and pressure of missing notes and trying to win back the crowd and bandmates. Each completed set unlocks whatever songs you played during the set in Quickplay mode. So once you finish all the performances, Quickplay mode should have all 42 songs from Live mode unlocked. The playlist is varied and basically hits every genre of music from Rolling Stones and Pearl Jam to Eminem and Rihanna to Katy Perry and Skrillex. And believe it or not, that Skrillex live performance will have you jumping up and down with the crowd! Now if those 42 songs aren’t enough for you, Guitar Hero TV should be able to satisfy your cravings. 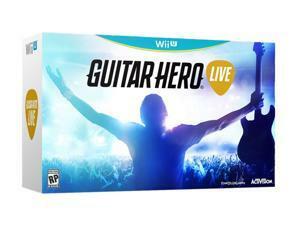 Guitar Hero TV is like a second game within Guitar Hero Live. There are two channels on Guitar Hero TV that stream music videos 24 hours that you can play along with, each channel having different shows and themes at certain times of the day. Thirty minutes could be all heavy metal videos, and on the other channel, it could all be pop videos for a half hour. At launch there were more than 200 videos that you can play along on Guitar Hero TV. But what if you don’t like any of the songs or shows streaming at the moment? Throughout your play on Guitar Hero TV, you earn coins where you’ll be able choose songs from the entire catalog to play on demand. You’ll also have the option to spend real cash on Hero Cash which you can spend on on-demand music, as well as different cosmetics for your profile, if you don’t feel like playing the game to earn them. Unfortunately, unlike previous iterations of Guitar Hero, you cannot purchase and own individual songs. Guitar Hero TV is like an amalgamation of what MTV used to be in the ‘80s and ‘90s and Spotify and I’m fine with it. It’s a great way to discover new music. 8.75 Overall, Guitar Hero Live is a huge jump forward for the music game genre while at the same time abandoning some of the things we loved about music games. If you can get past some of the things that are gone and embrace the new ideas, you'll have a great time playing fantasy rock star. The first person view of the Career mode is fun and immersive and does a great job of making you feel like a guitar hero… or a scrub if you’re terrible. GHTV is what we wish MTV was but never knew it. There's only 42 songs in the Career mode, which is pretty low, but more than 200 in Guitar Hero TV across all genres. It's a pretty solid playlist that everyone should find something they like. Once you can get past the learning curve and get used to the gameplay, you’ll find yourself playing Guitar Hero TV all the time. Especially since Activision announced that they’ll be continually adding new music to GHTV. The learning curve with the new peripheral might not be very fun for players. It doesn't have that "pick up and play" aspect at the moment. We’ve played Guitar Hero one way for 10 years and this change might turn off some people. But if you can get the hang of it, you can have a blast.